Do rheumatologists have a role in health promotion among elderly? 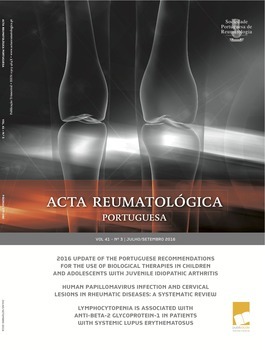 Human papillomavirus infection and cervical lesions in rheumatic diseases: a systematic review. A diagnosis of disseminated tuberculosis based on knee arthroscopic guided synovial biopsy in the context of monoarthritis. Exuberant plantar calcifications after corticosteroid injections. Carpal tunnel syndrome and fibromyalgia.